Georgetown University’s Global Social Enterprise Initiative has created an innovative Caregiver Journey Map that identifies pressure points providers must address to better serve residents and clients. It’s a cold and rainy day as Allison helps her mother, 82-year-old Greta, into the car to transport her to yet another doctor’s appointment. After the doctor, the 2 will again brave the elements, this time for a quick stop at the grocery store, to make sure the kitchen is stocked. Up since long before dawn, Allison will then spend the afternoon doing laundry, cleaning the house, and making sure Greta takes the medicines so important to her health and well-being. Allison isn’t a professional caregiver, and yet this day isn’t at all unique. It’s one of many, as Allison, a former administrative assistant, has traded in her professional life to stay at home and care for her mother, who suffers from a variety of ailments, including diabetes and dementia, that need constant management. She is one of over 40 million unpaid family caregivers for adults age 65 or older in the United States today. There’s no doubt Allison does this from a place of love and dedication, but that doesn’t make this role reversal any easier. But it’s becoming more of a universal experience each day, as people across the world are finding their lives changed by the daunting wave of responsibility associated with global aging—providing medical care, attending to daily needs, dealing with doctors, insurance companies and the like, while watching their parents’ health slowly deteriorate. Twenty percent of the US population is now over age 65. Ten thousand baby boomers turn 65 every day, stoking the growing wave of older Americans. As our population continues to live longer—by some measures, as much as 20 to 30 years longer than previous generations—this situation gives rise to a multitude of issues across many fields. With such complexity affecting so many, it will take a truly innovative approach to address what caregivers for aging adults need. Innovation is what Georgetown University’s Global Social Enterprise Initiative (GSEI) intended when it established the AgingWell Hub. According to the research of Gary Pisano and Roberto Virganti, there is awareness that the best ideas come from “all corners of the world,” and the availability of IT systems easily connects decision-makers. It is now conventional wisdom that no organization should attempt to innovate on its own. The structure of the AgingWell Hub supports this notion. It is a cross-sector collaborative that connects companies, organizations and agencies to develop shared frameworks that drive innovation and enhance product and service delivery to the aging population and their caregivers. The Hub harnesses the skills, expertise and networks of its member stakeholders to accelerate improvements in the quality of life for the aging population. It was established in 2015 with a grant from Philips and a clear vision: a world where communities enjoy integrated, connected solutions and services that enable older adults to live and age independently in the place they call home. The focus of the AgingWell Hub is explicitly on those who are aging, and specifically on untangling the entwined web of services designed to solve problems associated with financial, physical and emotional hardships. But, as collaboration experts predicted, the Hub encountered new ideas and unexpected insights when it embarked on its first sizable collaborative initiative. Through its research, brainstorming and insight-gathering process, it became clear that all roads converged on caregivers as a common focus area across all sectors. 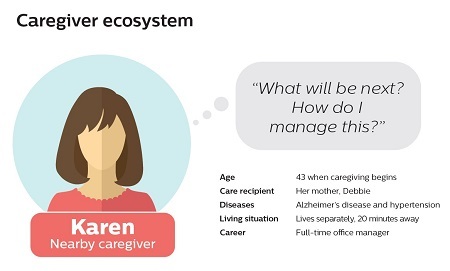 The outcome was a detailed Caregiver Journey Map, which chronicles an extraordinarily detailed path of care provision to a parent with Alzheimer’s. It served as a uniquely effective tool in establishing a common framework, and revealed critical pressure points that each AgingWell Hub collaborator or other actor in the health care and community services ecosystem can address. Editor’s note: The Caregiver Journey map is available to the public via the web link above. Printed versions are available while supplies last, and the AgingWell Hub can work with organizations to facilitate additional print runs. In the short time since it was completed, the map has been put to use in the aging ecosystem to boost advocacy work in support of the RAISE Act, in changing caregiver support practices in a clinical setting, for product development insight in the private sector, and as a strategic planning resource for foundations and charitable organizations. Through [the AgingWell Hub’s] research, brainstorming and insight-gathering process, it became clear that all roads converged on caregivers as a common focus area across all sectors. The valuable insight and utility of the Caregiver Journey Map would not have been possible without a collaborative model. Working group members, many of whom are LeadingAge members, agreed on a common set of objectives and proved willing to share proprietary research and contribute expertise to develop a tool that would benefit all. That said, collaborative models aren’t without challenges. These range from the simple—such as working around hectic schedules—to the more complex, as collaborators were mindful of potential competitive issues. At the end of the day, however, mutual trust was developed, and participants realized that cross-sector collaboration was key in order to generate breakthrough insights. What the group came to understand was that if the process is well executed, the process itself has the power to be as valuable as the end product, particularly when dealing with a topic as complex and nuanced as family caregiving. There is clearly great value in thinking through the myriad issues involved in delivering products and services to older adults and their caregivers, even if the thought process is oriented from a perspective outside of a single participant’s target audience. In addition, the collaborative process confirmed that the issues surrounding aging adults and their caregivers was one that couldn’t be solved by business alone—it is a multi-stakeholder process involving vast social and regulatory systems. For that reason, the group realized the importance of a social innovation approach versus a purely private sector approach. According to the World Health Organization (WHO), “the number of people aged 60 years or older will rise from 900 million to 2 billion between 2015 and 2050 (moving from 12% to 22% of the total global population).” And a recent AARP survey found that “87 percent of adults age 65-plus want to stay in their current home and community as they age.” But the truth is that as these adults desire to age in place, they frequently require assistance from a caregiver to make that a reality. What does this mean for other societal issues we are facing? Obviously, more time is needed to fully realize the impact of the AgingWell Hub group and its innovative approach, but the experience so far indicates that more cross-collaboration groups such as this need to be created in order to effectively address other public concerns. As a result, the AgingWell Hub is actively expanding application of its mapping methodology into different scenarios and conditions, and is eager to partner with new players in new areas because what this work shows is that—at least for aging—collaboration is key, as myopic development can’t and won’t meet the needs of the diverse stakeholders involved in aging care. Liddy Manson is director of the AgingWell Hub, a program at Georgetown University’s Global Social Enterprise Initiative (GSEI), part of the McDonough School of Business; Diane Ty is project director for GSEI and for the AgingWell Hub; and Consuelo Benito Olalla is an associate professor at the Universidad Pontifica Comillas in Madrid, and was a visiting GSEI fellow during summer 2017.